I jumped at the opportunity for a review copy of this title. Besides the fact that I’m able to read one of my favorite comic titles before its’ release date, I can also persuade (or at least attempt it) readers to grab a copy at their local comic shop. Jack and the rest of the team, except Regan, are investigating thunderbird sightings that have been reported across three states. These larger-than-life creatures are wreaking a massive amount of havoc, not to mention the Hoax Hunters don’t have what may be their most powerful weapon with them on this mission, Regan. The team gets attacked by these huge, demonic-looking creatures and of course, Jack is not buying it. When a team member gets snatched up by a thunderbird, her childhood friend comes to her aid. Meanwhile, Donovan and Regan are in South America searching for the Book of All Futures, and the demon that’s tied to the book’s curse. The Book of All Futures is a powerful but dangerous relic that could prove catastrophic if it falls into the wrong hands. Regan sensed Donovan was holding back from her (I’ve always said he’s not to be trusted), so he tells her what may be his darkest secret, the truth about himself. But is Donovan really telling Regan the truth? And will she fall for it? Moreci and Seeley continues to produce mind-blowing, adrenaline-inducing, horror stories that will leave you a feind for the next issue. Character interactions are eerie and Murder and Ken Cadaver creeps me out even more than Donovan. I laughed to myself after reading this issue because I had forgotten all about thunderbirds, large legendary creatures. Up until a few days ago, I only remembered mixing my Thunderbird with lemonade kool-aid back in the day! This dark, fun-to-read story was brought to life by T-Rex. His ghastly art with dark shadows and tones adds to that adrenaline rush from Moreci and Seeley. 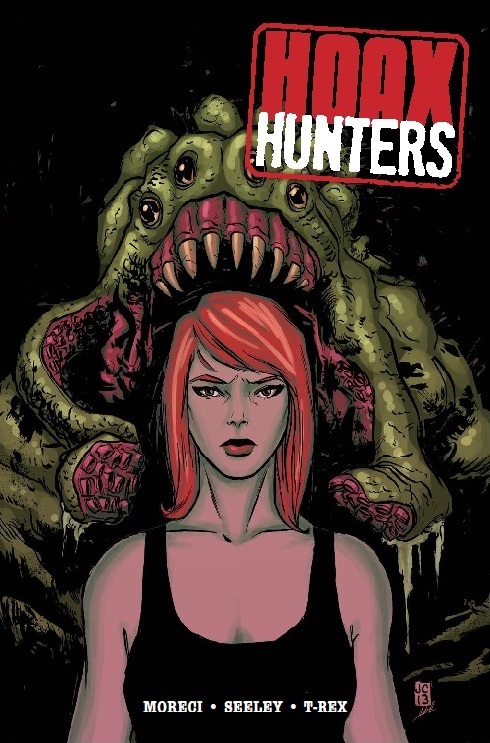 In my first and second reviews of Hoax Hunters, I lectured about buying single issues instead of waiting for the trade. Well, those lectures remain unchanged. It is more than obvious that I will continue to read Hoax Hunters. If not, then go back and re-read the first paragraph where I said that it’s one of my favorite comic titles. By the way, I hashtagged thunderbirds on Twitter! You’ll know what I’m talking about when you read issue #11 on Wednesday. I highly recommend this title to all fans and readers of dark, horror and sci-fy.